“Book Reviews: Western Europe,” Foreign Affairs (March/April 2019). “Book Reviews: Western Europe,” Foreign Affairs (January/February 2019). “Book Reviews: Western Europe,” Foreign Affairs (November/December 2018). “Book Reviews: Western Europe,” Foreign Affairs (September/October 2018). «STRAPPIAMO L’UE AI POPULISTI: Attenzione alle manie di integrazione,» Il Forum (23 Ottobre 2018). For a PDF copy, click here. “Book Reviews: Western Europe,” Foreign Affairs (March/April 2018). “Book Reviews: Western Europe,” Foreign Affairs (January/February 2018). “Book Reviews: Western Europe,” Foreign Affairs (November/December 2017). “Book Reviews: Western Europe,” Foreign Affairs (September/October 2017). “One Year after the Brexit Vote Britain's Relationship with the EU is Unlikely to Change Much: Here's Why?,” Washington Post (26 June 2017). For a PDF copy, click here. “Europe pays its fair share, whatever Donald Trump says,,” Financial Times (26 May 2017). «L'Europa, Super potenza invisibile destinata a durare per decenni,» Giornale di Brescia (9 maggio 2017). «L'Europa non è in crisi esistenziale ma fa notizia quando non funziona,» Giornale di Brescia (Giovedi 4 maggio 2017). “Book Reviews: Western Europe,” Foreign Affairs (May/June 2017). “Europe is Still a Superpower,” Foreign Policy Magazine (13 April 2017). “Book Reviews: Western Europe,” Foreign Affairs (March/April 2017). “Enemies of Europe Never Changed,” Visegrad Insight Respublica, (24 March 2017). “The Future of Europe: Coping with Crisis,” Great Decisions 2017 (New York: Foreign Policy Association, 2017). “Book Reviews: Western Europe,” Foreign Affairs (January/February 2017). “Europe's Ugly Future: Muddling Through Austerity,” Foreign Affairs (November/December 2016). “Book Reviews: Western Europe,” Foreign Affairs (November/December 2016). “Brexit: Welcome, Britain, to the Hotel California,” Princeton Alumni Weekly (14 September 2016). “Taking the Lead: Interview with Andrew Moravcsik,” WNYC: Note to Self with Manoush Zomorodi (29 July 2016). “Lessons from Ukraine: Why a Europe-led Geo-Economic Strategy is Succeeding,” (Washington DC: German Marshall Fund, 2016). “Russia: A Test for Transatlantic Unity,” (Washington: Transatlantic Academy, German Marshall Fund, 2016). (with Nelli Babayan, Marie Mendras, Chris Miller, Ulrich Speck, Angela Stent, and Stephen Szabo). Валерий Ковалевский, “Фонд Маршалла: Россия настроена на противостояние с Западом,” Voice of America - Russian Language News (10 May 2016). “Book Reviews: Western Europe,” Foreign Affairs (May/June 2016). “Opinion: The United States is riding Europe's superpower coattails, The Washington Post (15 April 2016). “The Great Brexit Kabuki - a Masterclass in Political Theatre, Financial Times (8 April 2016). “Book Reviews: Western Europe,” Foreign Affairs (March/April 2016). “Book Reviews: Western Europe,” Foreign Affairs (January/February 2016). “Success in Ukraine Could Threaten Western Unity,” Transatlantic Take (German Marshall Fund of the United States, 20 November 2015). “Ukraine: Why the West Must Be Flexible,” The Globalist (25 November 2015). “Why I Put My Wife's Career First,” The Atlantic (October 2015). “Class Notes - Class of 1979,” Stanford Magazine (March/April 2016). Elisabeth Niejahr, “Daddy Uncool: Im Taxi mit dem Ehemann von Anne-Marie Slaughter,” Die Zeit (3 March 2016). Ruben Navarrette, “Am I a stressed, tired, rushed dad? Yes. But I'm also enormously thankful,” Fox News Opinion (9 November 2015). “Moravcsik on Stay-at-Home Dads,” GPS with Fareed Zakaria (18 October 2015). Beth Hand, “How Gender Bias Hides Men Too,” The Huffington Post (7 October 2015). Paula Escobar Chavarría, “Breaking the Taboo of Earning More Than Your Husband,” The Huffington Post (Latino Voices) (29 September 2015). “Making Our Workplaces Work for Everybody,” On Point with Tom Ashbrook (NPR, 28 September 2015). “'Unfinished Business': When Working Families Can't Do It All,” NPR Weekend Edition (27 September 2015). “Why I Put My Wife's Career First,” Huffpost Live (23 September 2015). “Anne-Marie Slaughter and Andrew Moravcsik on Work-Life Balance,” Massachusetts General Hospital Center on Brain, Law and Behavior (21 September 2015). Amy Joyce, “On Parenting: "If Women 'still can't have it all,' Here's How Dads Can Help Everyone Have More,” Washington Post (18 September 2015). Robert Franklin, “Andrew Moravcsik: Fatherhood's Good for Dads, Motherhood Bad for Mom,” National Parent's Organization (17 September 2015). Kristin van Ogtrop, “Why Ambition Isn't Working for Women,” Time (Cover Story) (17 September 2015). Davide Casati, “Andreste in congedo paternità per la carrier della mamma?,” Corriere della Sera (27 ora) (17 Sept 2015). KJ Dell'Antonia, “Your Family, or Your Job? Why We Shouldn't Ask Which Comes First,” New York Times: Motherlode – Living the Family Dynamic (17 September 2015). Charlotte Allen, “Atlantic Writer's "Why I Put My Wife's Career First" Actually Argues That Men Are Better Than Women,” Independent Women's Forum (16 September 2015). “One Husband Puts His Wife's Career Before His Own,” Marketplace with Kai Ryssdal (NPR, 15 September 2015). “His wife said women 'can't have it all.' Now hear his side of the story. Society must be more open to male lead parents, professor says,” The Advisory Board Company: Daily Briefing (14 September 2015). Juliane Helinek, “Anne-Marie Slaughter's Husband Speaks Out,” Take the Lead: The Movement Blog (14 September 2015). Dave McGinn, “Sorry, mom and dad, but you can't have it all. Someone has to be the 'lead parent',” The Globe and Mail (14 September 2015). Ester Bloom, “Parenting: Too Many Millennial Dads Are Hypocrites. But There's Hope,” The Billfold (11 Sept 2015). Liam O'Hagan, “It's Time to Retire "Mr. Mom",” The Huffington Post (11 September 2015). “Book Reviews: Western Europe,” Foreign Affairs (November/December 2015). “Book Reviews: Western Europe,” Foreign Affairs (September/October 2015). “Book Reviews: Western Europe,” Foreign Affairs (May/June 2015). “Book Reviews: Western Europe,” Foreign Affairs (March/April 2015). “Book Reviews: Western Europe,” Foreign Affairs (January/February 2015). “Book Reviews: Western Europe,” Foreign Affairs (November/December 2014). “Book Reviews: Western Europe,” Foreign Affairs (September/October 2014). “Ultimately, the Member States Decide: Interview with Andrew Moravcsik on the Scottish Referendum and European Union Politics,” Verfassungsblog - on Matters Constitutional (27 Sept 2014). “Book Reviews: Western Europe,” Foreign Affairs (May/June 2014). “Book Reviews: Western Europe,” Foreign Affairs (March/April 2014). “Book Reviews: Western Europe,” Foreign Affairs (January/February 2014). “L'Europe sur le divan,” in Jean-Hervé Lorenzi et Christian de Boissieu (Le Cercle des économistes), eds. Et si le soleil se levait à nouveau sur l'Europe? (Paris: Fayard, 2013). “Book Reviews: Western Europe,” Foreign Affairs (November/December 2013). “Europa ist auf der richtigen Seite der Geschichte,” Die Presse (Wien) (26 September 2013). “Why Europe is the Other Superpower of the 21st Century (and China is Not),” Bernard Schwartz Distinguished Lecture, Johns Hopkins School of International Studies (5 September 2013). “Book Reviews: Western Europe,” Foreign Affairs (September/October 2013). “Book Reviews: Western Europe,” Foreign Affairs (May/June 2013). “Book Reviews: Western Europe,” Foreign Affairs (March/April 2013). “The (Smart) Politics of EU Posturing,” The Monkey Cage (24 January 2013). A revised version: “Squaring The Circle In London: Cameron The European” Social Europe Journal (29 January 2013). “Book Reviews: Western Europe,” Foreign Affairs (January/February 2013). “Book Reviews: Western Europe,” Foreign Affairs (November/December 2012). “Book Reviews: Western Europe,” Foreign Affairs (September/October 2012). “Eurozone: Closer Fiscal Union,” CNN TV: Christiane Amanpour (26 June 2012). “Europe after the Crisis,” New York Times / International Herald-Tribune (23 April 2012). For a version in MS Word, click here. “Europe After the Crisis: How to Sustain a Common Currency,” Foreign Affairs (May/June 2012). “Book Reviews: Western Europe,” Foreign Affairs (May/June 2012). “Recent Books: Western Europe,” Foreign Affairs (March/April 2012). “Recent Books: Western Europe,” Foreign Affairs (January/February 2012). "Dissolving the Eurozone Would Be Difficult, Much Less the EU," Interview with ΤΟ ΒΗΜΑ (25 November 2011). “Recent Books: Western Europe,” Foreign Affairs (September/October 2011). “The EU will Last,” The New York Times (12 September 2011) (with Mareike Kleine). “Powerhouse Europe: Why European Power Still Eclipses China,” (Munk School of Global Affairs, University of Toronto, 3 May 2011). 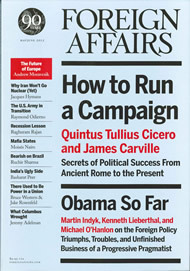 “Recent Books: Western Europe,” Foreign Affairs (May/June 2011). “European Dis-Union,” America Abroad Media (Radio: February 2011). “Recent Books: Western Europe,” Foreign Affairs (March/April 2011). “Recent Books: Western Europe,” Foreign Affairs (January/February 2011). “Recent Books: Western Europe,” Foreign Affairs (September/October 2010). “Europe: Quietly Rising Superpower in a Bipolar World,” in Alan Alexandroff and Andrew Cooper, eds., Rising States, Rising Institutions (Washington: Brookings Institution Press, 2010). 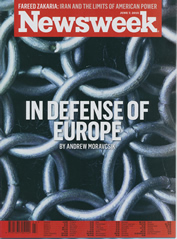 “In Defense of Europe: Now More than Ever, it’s not Smart to Bet on the EU’s Demise,” Newsweek (30 May 2010, Cover Story). For a .pdf version of the article, click here. 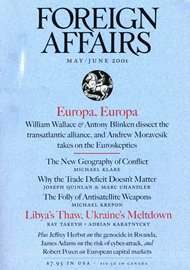 “Recent Books: Western Europe,” Foreign Affairs (May/June 2010). 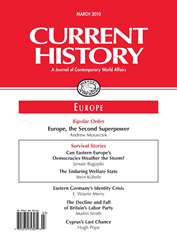 "Europe: The Second Superpower," Current History (March 2010). "Recent Books: Western Europe," Foreign Affairs (March/April 2010). “U.S.-EU Relations: Putting the Bush Years in Perspective,” in Federiga Bindi, ed. The Foreign Policy of the European Union: Assessing Europe’s Role in the World (Washington: Brookings Institution, 2010). "Why is Europe, not China or India, the Second Superpower of the 21st Century?" Radio Interview on WILL/Illinois Public Radio (27 January 2010). "Recent Books: Western Europe," Foreign Affairs (January/February 2010). "Conference : the European Union after the Lisbon Treaty" (Joint Lecture and Discussion with French Ambassador Pierre Vimont) Consulate of France, New York, NY (December 2009). "Recent Books: Western Europe," Foreign Affairs (November/December 2009). "The Quiet Superpower," Global Europe (14 September 2009). For a response and debate, click here. "Recent Books: Western Europe," Foreign Affairs (September/October 2009). "Europe Defies the Skeptics: How Crisis Will Make the EU Stronger," Newsweek (1 August 2009). English Translation: "A Transatlantic Dialogue on Democracy and its Future," EUI Review (Summer 2009). "Ignore the Skeptics: The European Union is Doing Just Fine," Newsweek (International editions, 29 June 2009). "NATO and the European Union," Panel IV at NATO at 60 Symposium (Council on Foreign Relations, 26 February 2009). "The Myth of Europe's 'Democratic Deficit'," Intereconomics: Journal of European Economic Policy (November-December 2008). "Interview: Turkish Accession as Part of a Multi-Level Europe?" Republic (Athens, Greece, November 2008). For a .pdf version of the interview, click here. "What We Learned in China," Princeton Alumni Weekly (22 October 2008) (with Anne-Marie Slaughter). "Another Angle: Few Voters Know or Care about the European Union," E! Sharp (September-October 2008). "Don't Know? Vote No!" Prospect (July 2008, London). 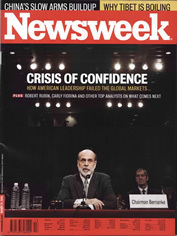 "Washington Cries Wolf," Newsweek (International edition, 31 March 2008, Cover Story). For a .pdf scan of the article as it appeared in Newsweek, click here. Translated into Chinese in Can Kao Xiao Xi (25 March 2008). "Make Way for the Quiet Superpower," Newsweek (International edition, 31 December 2007). "European Integration: Looking Ahead," Great Decisions 2008 (Foreign Policy Association, New York, 2008). "Marxist Populism," Prospect (December 2007, London). For a .pdf scan of the article as it appeared in Prospect, click here. "The Self-Absorbed Dragon," Newsweek (International edition, 29 October 2007). Translated into Chinese in Can Kao Xiao Xi (22 October 2007). "Soft Power's Libyan Triumph," Financial Times (30 July 2007, Opinion and Comment). "A Rogue Reforms: Libya Comes in from the Cold," Newsweek (International editions, 16 July 2007). Contribution to "Symposium: American exceptionalism - Is there a moral high ground?" International Herald Tribune (23 May 2007). "Europe's Anti-Ballistic Missile Defense," Newsweek (International edition, 30 April 2007). “On Foreign Policy, plus ça change…,” International Herald-Tribune (18 April 2007). For commentary on this article in Le monde, click here. "Beyond the Grand Illusion," in European Union: The First Fifty Years - Fifty Top Thinkers Set Out their Ideas for Europe (London: Financial Times, 2007). "The World's Quiet Superpower," European Voice (29 March 2007). "50 Jahre Römische Verträge: 'Europas Stärke ist zivil'," Frankfurter Allgemeine Zeitung (25 March 2007, Sunday edition). Contribution to the Symposium, "The Big Question: Left and Right Defined the 20th Century. What's Next?" Prospect (London, April 2007). "No Power to the People," Newsweek (International edition, 5 February 2007). “What Can We Learn from the Collapse of the European Constitutional Project? A Symposium", Politische Vierteljahresschrift 47:2 (forthcoming 2006). Part of a forum with Fritz Scharpf, Michael Zuern, Wolfgang Wessels, and Andreas Maurer. Responses by Pepper Culpepper and Archon Fung, James Fishkin, Mark Franklin, Paul Magnette, Giandomenico Majone, Jeremy Rabkin and Loukas Tsoukalis, and Moravcsik's "Response to Eight Critics." French Translation: "Que faut-il retenir de l’effondrement du Projet Constitutionnel Européen?" "Open the Doors," Newsweek (International edition, 2 October 2006). "Rumors of Europe's Demise are Greatly Exaggerated," The Washington Note (8 June 2006). For a response by Charles Kupchan, click here. "Response to Charlie Kupchan," The Washington Note (10 June 2006). "Why Europe Should Dare to be Dull," European Voice (8 June 2006). "The Constitution is Dead! Long Live the Constitution!" Europaische Rundshau (2006 Special edition). "Déjà Vu All Over Again: US-European Relations Still Rocky," Newsweek (International edition, 15 May 2006) (Word version). "The Threat from Europe: Jeremy Rabkin's Case for Sovereignty," Prospect (April 2006). "Es gibt keine Krise in der EU," Der Kurier (Wien, 29 Januar 2006). "Failing to Learn their Lessons: Rhetoric and Reality in the European Union," Financial Times (Special Section on the Future of Europe, 27 January 2006). Italian: "Il futuro dell'Europa è nei «piccoli passi»" Corriere della Sera (Medcoledi, 8 febbraio). Response: Kirsty Hughes, "The Debate about Europe's Future has Got to Make the Issue of Democracy Striking and Understandable," Financial Times (31 January 2006). "Europe Will Get It Right," Newsweek (International edition, 26 December 2005). "The Future of the Constitutional Process of the European Union," Report to European Parliament Symposium (13-14 October 2005) (with Kalypso Nicolaidis). "Dog and Tony Show," Newsweek (International edition, 7 November 2005). "Brussels Diary: An End to Constitutional Confusion," Prospect (October 2005, 10th Anniversary Special Issue). "World View: The Wonderful World of Oz," Newsweek (International edition, 19 September 2005). “Für ein Europa ohne Illusionen,” Süddeutsche Zeitung (14 July 2005). "Europe without Illusions," Prospect (July 2005) (cover article with commentary by Larry Siedentop, Gisela Stuart, John Kay, Sunder Katwala, Charles Grant, Michael Maclay, Philippe Legrain). "A Too Perfect Union? Why Europe Said 'No,'" Current History (November 2005). “La ricetta per l’Ue? Abbandonare le grandi illusioni,” Corriere della Sera (venerdì, 17 giugno 2005). "Europe Works Well Without the Grand Illusions," Financial Times (13 June 2005). "Time Has Come for Politicians to Offer a Serious Mea Culpa," Ta Nea (Athens, 4 June 2005). "Europa takelt niet af, maar is juist stabiel," NRC Handelsblad (Amsterdam, 3 June 2005). "The Politics of Plebiscites," Newsweek (International edition, 9 May 2005). “An Ocean Apart,” The American Prospect (March 2005). "Dream on America," Newsweek (Cover Story, 31 January 2005, International edition). Letters from readers of "Dream on America" (forthcoming in Newsweek's "Mail Call," 14 March 2005, International edition). For further commentary, see: Stephan Richter, "The Real Newsweek Scandal," The Globalist (20 May 2005). "It's the Job, Stupid: Europe and Global Leadership," Newsweek (December 2004, "Issues 2005" Special Davos Issue). "Don't Sweat the Big Stuff," Newsweek (Atlantic edition, 10 January 2005). "EU Got that Thing," The American Prospect (January 2005). "How the World Sees It," Newsweek (Atlantic edition, 15 November 2004). "Europe is the New Role Model for World," Financial Times (5 October 2004). "Euroskeptic but Sane: Booker and North's The Great Deception: A Secret History of the European Union," Prospect (August 2004). 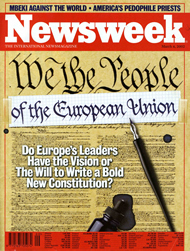 "Europe Takes Charge," Newsweek (Atlantic edition, 5 July 2004). "Europe's Slow Triumph," Newsweek (Atlantic edition, 21 June 2004). "The Perils of Partnership," Newsweek (Atlantic edition, 10 May 2004) (with Grzegorz Ekiert). "No Reverse Gear, Please" Newsweek (Atlantic Edition, 3 May 2004). "Commentary: European Defense," E!Sharp (Brussels, April 2004). "The Myth of a European Leadership Crisis in an Era of Diminishing Returns," Challenge Europe (March-April 2004). Responses by Kalypso Nicolaidis, Paul Magnette, and James Palmer. "One Year On: Lessons from Iraq," in Gustav Lindstrom and Burkard Schmitt, eds., One Year On: Lessons from Iraq (Chaillot Paper No. 68) (Paris: European Union Institute for Security Studies, March 2004). "The Unsung Constitution," Prospect (March 2004). "Kick the Can, Please!" Newsweek (Atlantic edition, 22 December 2003). "The Death of Tory England," Newsweek (10 November 2003, Atlantic edition). "Debate: Should the European Union be Able to Do Everything that NATO Can?" NATO Review (Autumn 2003) (with Fraser Cameron). "Look at the Small Victories," Newsweek (29 September 2003, Atlantic edition). "A Tory Referendum," Prospect (July 2003). "Striking a New Transatlantic Bargain," Foreign Affairs (July/August 2003). Reprinted: James F. Hoge, Jr. and Gideon Rose, eds, American Foreign Policy: Cases and Choices (New York: Norton, 2003). 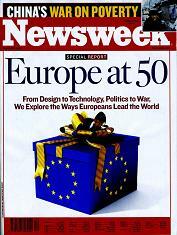 "Europe Comes of Age," Newsweek (23 June 2003, Atlantic edition). "The World is Bipolar After All," Newsweek (5 May 2003, Atlantic Edition). "How Europe Can Win without an Army," Financial Times (3 April 2003). "The EU Ain't Broke," Prospect (March 2003). For an amusing criticism from a Eurosceptic website, click here. And for their subsequent apology, click here. "Another Decade of Diversity," Newsweek (6 January 2003, Atlantic Edition). "The Quiet Superpower," Newsweek (17 June 2002, Atlantic Edition). "The Human Rights Blame Game," Newsweek (22 April 2002, Atlantic Edition). "If it Ain't Broke, Don't Fix It! Europe's Rhetoric and America's Fears," Newsweek (4 March 2002, Atlantic Edition). "Despotism in Brussels? Misreading the European Union," Foreign Affairs (May/June 2001). If you are unable to access an electronic version of any selection, please contact <amoravcs@princeton.edu> to obtain a hard copy. Please send any questions, suggestions, or complaints concerning the coding or maintenance of this website to Helene E. Wood at hwood@princeton.edu.